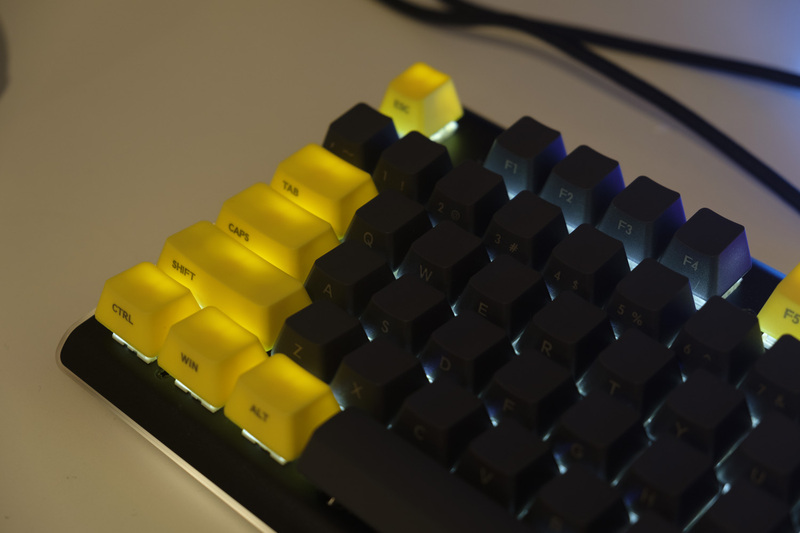 Today we’re looking at some keycaps made by Drevo, the makers of many rather good mechanical keyboards. Here’s what you need to know! Materials: These keycaps are made from PBT, a kind of plastic. PBT is generally considered to be a more premium alternative to the most common keycap material, ABS. PBT is preferred by some because it offers a slightly rougher finish and better durability. However, like many elements of the world of mechanical keyboards, this is a matter of personal preference as well. The keycaps are 1.5mm thick. Legends: The legends are laser etched on the front of each keycap. This removes the possibility of wearing through the labels over years of typing, and also makes for a slightly unique look. Profile: The keycaps have a standard or OEM profile, meaning they get taller as you go from the bottom row to the top row. This is how most modern keyboards are designed, and should be comfortable for more users. 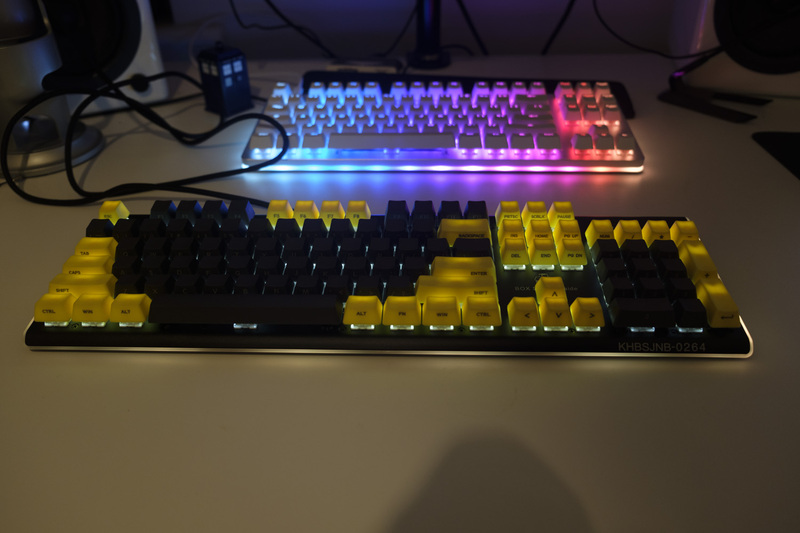 Colour: The keycaps are available in four colour schemes: all yellow; all grey; grey modifiers and yellow alphanumerics; yellow modifiers and grey alphanumerics. We’ve opted for this last option, which provides a more visually interesting look than having all of the keycaps in one colour. However, it does mean that we’ll have to plan our LED lighting with the colour scheme in mind. In daylight, all of the legends are visible, but in darker conditions only the yellow keycaps can be easily read. Compatibility: It’s important to make sure the layout of your custom keycaps match that of your keyboard. In our case, both are ANSI / USA, so there’s no problem — each of the keycaps can be replaced like-for-like. You should also make sure that your keyboard uses Cherry MX or MX-style switches, but this includes most mechanical keyboards these days! Impressions: We installed the keycaps on Kailh’s Box Switch Commemorative Keyboard. This keyboard comes with unusual two-tone keycaps, white backlighting and RGB perimeter lighting. 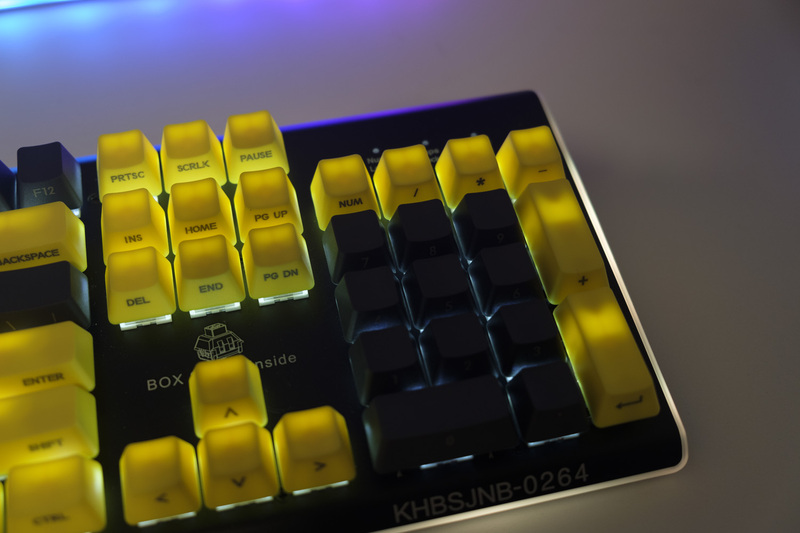 In order to colour coordinate, we turned the key backlighting to maximum to really light up the yellow keycaps, and set the perimeter lighting to a pulsing shade of yellow. Overall, it’s a nice effect that really transforms the appearance of this keyboard in a fun direction. Of course, new keycaps aren’t just for aesthetics — they can also change the feel of a keyboard. The new PBT material feels nice under our fingers, slightly textured but not too scratchy. The moderate weight of the keycaps also has a small effect on the typing feel, making for a crunchier sound when typing quickly. Ultimately, we’re happy with the quality of these keycaps and the new look they provide. 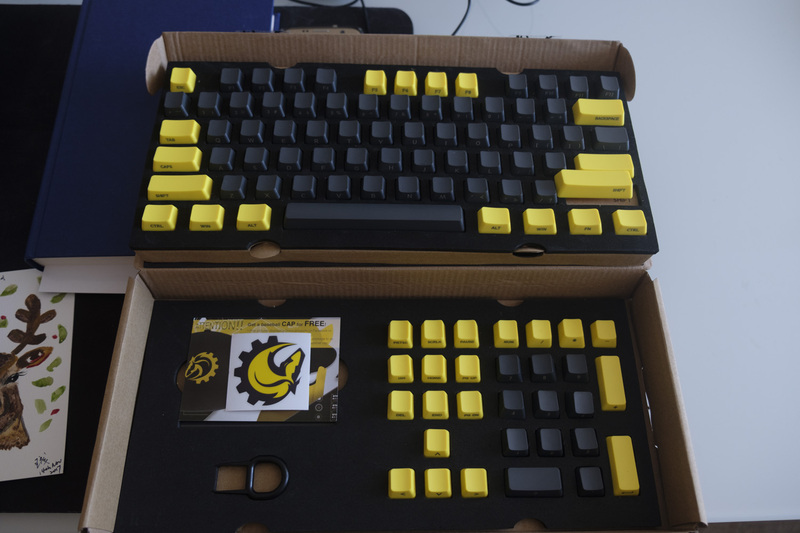 If you want to transform your own keyboard in the same way, take a look at the product page linked below at ArmYourDesk.